Molecules just don’t like to stay put. They’re liable to run off and hook up with the first available oxygen or hydrogen they find sitting on the nearest barstool. Having essentially no weight they are off like a prom dress at the drop of a hat and blown about on the fickle breezes of fate. Molecules, the tiny building blocks of matter; disseminate ceaselessly through space and over time. And that goes double for all sorts of molecules we use to make our lives easier; like pesticides and herbicides for instance. They just don’t stay put. All life is related genetically. We share base DNA with the green plants and with the squirrels. All across this hugely small planet living things are much more alike than they are different. This is why the things that we use to kill other species can also make us sick or die. And so I cannot help but to be saddened by the continued contamination of our molecule recycling ecosystem by factory farming governed by short term financial goals. Those darn molecules! If only they would stay where they belong instead of drifting into the water supply, raining down on the children, being breathed into the lungs and onto the skin of every animal or human that happens by their orbit. Once inside, herbicides and pesticides damage tissues, organs, growing children, babies and pets. Delayed symptoms of 20 -30 years lull farmers and their neighbors into a false sense of security; only to be later devastated (physically and financially) by medical issues and the side effects of the still relatively primitive state of current medical knowledge. We live in the Age of Unintended Consequences. Short term, short sighted policies have brought vast temporary wealth and security to billions. But at a price our grandchildren may be loath to pay. Change always begins in the mind. We first visualize the future we begin to create for ourselves now. How we as a society define success defines how we spend our time each day. Is success having more than can be used up in your lifetime? Or is it the size of your trusted and loyal circle of true friends? What do people think about during their last days on Earth? Hint: It is almost never “I wish I had more toys”. I have observed that people tend to focus on the people they love and regret the times they turned away from love. Memorial services inevitably focus on the acts of generosity performed by the deceased, not on the size of their 401k. This is the Soapman asking all of us to think just a little bit on what is truly important to us; and to what in retrospect may seem little more than a long hobby. And get some swimming hole time in! The days are already getting shorter as our big (and not so big) blue ball makes its way around the sun. 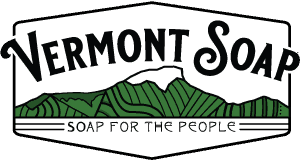 Larry Plesent is a writer, blogger, chief formulator and CEO of the Vermont Soap Company where he spends his days making yummy stuff to replace the yucky stuff of questionable safety.